Since Romney won the nomination, Chicago has implemented a two pronged strategy to win reelection. First, Obama attempted to harden the support of young, non-white, and college educated voters by focusing on a series of wedge issues ranging from Planned Parenthood to the Dream Act. The second prong of Obama’s strategy sought to prevent Romney from consolidating traditionally Democratic white working class votes by pledging to advance the interest of the middle class while attacking Romney’s tax returns, tax policy, time at Bain Capital, and outsourcing. The first plank of Obama’s strategy appears to have succeeded, which is why Obama leads in Pennsylvania, Nevada, and New Mexico, and is locked in a tight race in traditionally conservative states like Colorado, Virginia, and North Carolina, where Obama is dependent on the new version of the Democratic coalition. The success of the base strategy is hardly surprising, given spring and summer polls showing Obama maintaining ’08 levels of support among non-white and well-educated voters. But the surprise of the summer campaign is the apparent success of the second plank of Obama’s strategy, which seems to have ameliorated much of Obama’s weakness with white working class voters in the industrial Midwest. On paper, Ohio should be a lost cause: it’s a traditionally Republican state full of the white working class voters who have abandoned the president everywhere else in the country. But some combination of the auto-bailout, a relatively state strong economy, the state's anti-anti-union backlash, and more Obama ad spending than anywhere else in the country appears to have produced a modest but clear Obama lead in the Buckeye State. Romney led in exactly one public survey between the conventions and early June, when the Obama campaign shifted to a negative ad strategy. On average, Obama led by more than 2.5 points in Ohio, compared to just 1.5 points nationally. Recent polls point toward tightening in the state, but recent reports suggest that the campaigns also see Ohio as tilting toward Obama. Obama’s chief pollster Joel Benenson could barely restrain his excitement as he explained Obama’s lead in Ohio, while a Politico article quoted unnamed Republican strategists ostensibly armed with internal polling data showing Romney trailing by as much as the high-single digits in the Buckeye State. 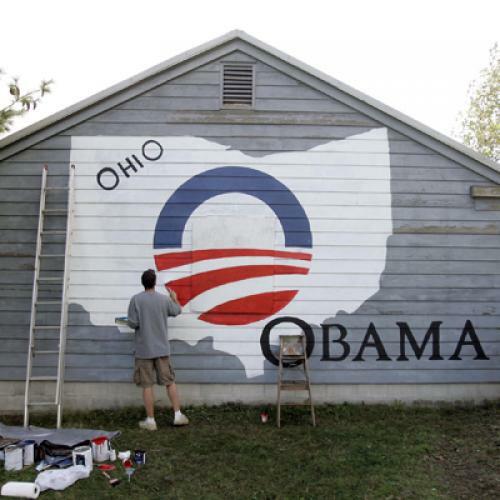 And the campaigns have acted on their belief that Ohio leans toward Obama. Romney’s attack on welfare reform was transparently directed at white working class conservatives that probably should already be in Romney’s camp, like those in Ohio. Obama’s entire acceptance speech read like an attempt to consolidate Ohio. His widely-panned and modest address featured just a few nuts and bolts pitches: 1,000,000 new manufacturing jobs, 600,000 new jobs in natural gas (what happened to green jobs? ), and 100,000 new teachers. Backing new manufacturing and natural gas jobs might not resonate in Tampa, Des Moines, or northern Virginia, but it would have struck home in a place like Youngstown. The local economy is doing surprisingly well in northeastern Ohio, thanks to a bustling General Motors plant (one of the largest in the country) and a natural gas boom that has already yielded a new pipeline, manufacturing plant, and plenty of energy-sector jobs. The strength of the manufacturing sector and the shale gas boom are largely responsible for Ohio’s relatively low 7.3 percent unemployment rate, so Obama’s seemingly ambitious goals might have held credibility along the Mahoning River, and could have even produced—dare I say—hope for cautiously optimistic voters observing rare signs of life in a region devastated by the end of the steel industry. Given that Obama reduced his support for Planned Parenthood, a pathway to citizenship for illegal immigrants, green jobs, and gay marriage to series of allusions, he was just a few deletions away from an op-ed in a local Youngstown newspaper. While it might seem small to focus a nationally televised address on northeastern Ohio, it’s not hard to see why the Obama campaign wouldn’t choose to move a few more chips into Ohio. The Obama campaign’s advertising strategy suggests that they consider the states that voted for Kerry and Gore plus New Mexico clearly in their column. If Obama added Ohio to those states and Nevada, where Romney hasn’t led in a single poll, Obama would hold 271 electoral votes. In this scenario, Obama could win reelection while losing Colorado, Virginia, Florida, North Carolina, New Hampshire, and Iowa. And Obama's decision to focus his appeal on Ohio doesn't jeopardize necessarily jeopardize his chances in any of the other battlegrounds, many of which come down to simple cold-hearted turnout games in states divided along educational or racial lines. In 2008, Obama's weakness along the Mahoning and Ohio Rivers was largely for the state's Republican lean. In 2012, new strength in northeastern Ohio, coupled with resilient appeal in Columbus and a strong African American turnout in Cleveland and Cincinnati could be enough to win the state. Could Romney become the first Republican to win the presidency without Ohio? Sure: All he would need to do is win every other mutually contested battleground state, or win a traditionally Democratic-leaning state like Wisconsin, Michigan, or Pennsylvania to counter additional losses.